Blackpool boss Terry McPhillips felt the referee’s failure to award his side a “nailed on” penalty during their 1-1 draw at Sunderland denied the Seasiders a huge three points. With Blackpool already leading courtesy of Armand Gnanduillet’s first-half stunner, McPhillips’ men felt they had a strong claim for a spot-kick at the start of the second half. Sunderland were denied a spot-kick in the first half when Jack Baldwin, who headed the equaliser 15 minutes from time, went sprawling in the box but replays indicated a dive. When asked if the referee had been swayed by the 27,580 crowd and by his earlier decision not to award the home side a penalty, McPhillips said: “100 per cent yes but that’s the way it is. 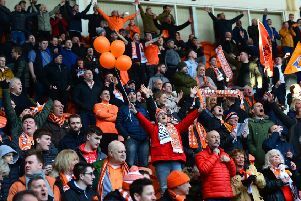 Blackpool had to survive a mini-defensive crisis at the Stadium of Light, with Donervon Daniels picking up a knock pre-match and Marc Bola injuring his hamstring just four minutes in. With no defenders on the bench, it meant midfielder Harry Pritchard had to fill in at left-back. McPhillips added: “Pritch went in there and I thought he was magnificent. There were some good performances but losing Marc Bola early doors and Donervon Daniels not making it pre-match means we’re a bit short on defenders. “We had to move a few players around but I thought the attitude and application was great. They got a bit bigger with Charlie Wyke coming on but we didn’t quite defend the corner well enough for their goal. It’s a shame because it would have been a hell of a victory.